The alb pattern has a hood. Is it possible to make the alb without the hood? 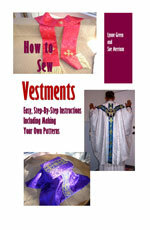 It is possible to make the alb without the hood. You will need to cut a piece of facing the same size as the neck opening and pin it to the neck opening, right sides together. Then Stitch and turn inside, pressing it in place. Then slip stitch it in place.